Saturday I photographed a demonstration at which the police could not have been more helpful. Perhaps hardly surprising, since they were a part of the ‘Not Another Drop‘ campaign started in 2001 by the Community Safety Partnership uniting the Met and Brent Council. 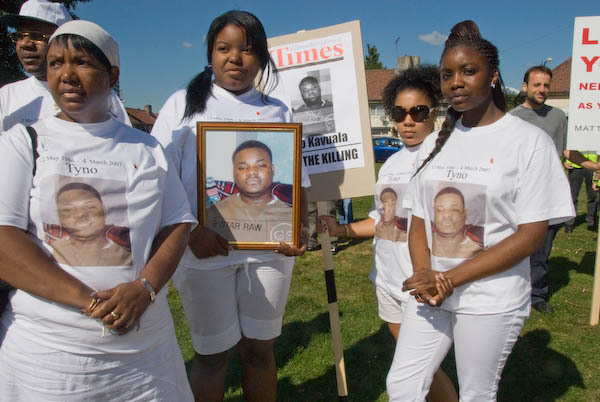 The annual Peace March – this was the fourth – was founded by Patsy Hopwood, whose student son, Kavian Francis-Hopwood was shot dead on the Stonebridge Estate in 2003 – still an unsolved crime. Supporting the march were several local church groups (including a Brazilian congregation from the area) and families of several of the many young people who have met similar violent deaths in Brent in recent years, many of whom were shown on posters carried in the march. Although obviously the aims of the march can only be applauded, it was perhaps disappointing not to see greater support from the various communities in the area, with only around 250 gathering for the start of the march at Stonebridge, although more were expected for the rally at the end of the event in South Kilburn. 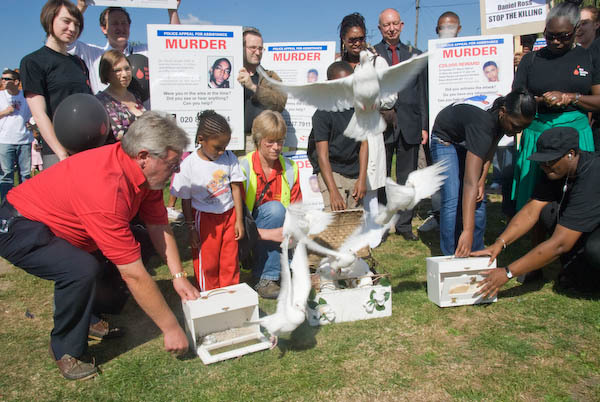 One of the trickier parts of the event for the half-dozen or so photographers present was the release of white doves shortly before the march started. I’m still not quite sure whether to rely on my reflexes or the 5 fps mode of the D200 to try to catch the peak moment. What I actually did was to try to catch the moment and then hold my finger down to get the next few frames at 5 fps. In fact the second exposure turned out to be the best, but I was left wishing I had one slightly earlier – and perhaps slightly later. It’s one of the few situations where I’d really like to have the 9fps that Nikon promise us for the D3 due later this year. More pictures from the event on My London Diary. This entry was posted on Thursday, September 20th, 2007 at 08:11 pm and is filed under My Own Work, Photo Issues, Technical. You can follow any responses to this entry through the RSS 2.0 feed. You can leave a response, or trackback from your own site.